It is our pleasure to welcome all of you to the MyShadi Bridal Expo, which will give you a hands-on approach to wedding planning. 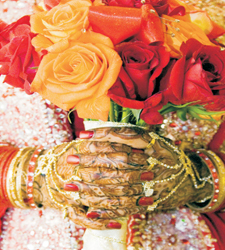 Over 50 wedding professionals are on hand in an elegant layout designed to create an ambiance of splendor. Get ready to be dazzled by two unique fashion shows that will highlight the latest trends in wedding and formal fashions. A wide range of event planning vendors are on hand to showcase their products and services. Mandaps and reception table settings are on display to guide brides and their families in their wedding planning decisions. Photographers are available to present their work and discuss their style, which is sure to put couples and their families at ease. Caterers and bakeries are offering guests delectable samples. Guests will even be able to shop on site for clothing, jewelry, and accessories. MyShadi Bridal Expo welcomes the opportunity to work with Platinum Sponsors Crowne Plaza Ravinia, Occasions by Shangri-la, TV Asia, and Qatar Airways and Trip Explorer. Get ready to be dazzled by two unique fashion shows that will highlight the latest trends in wedding and formal fashions. A wide range of event planning vendors are on hand to showcase their products and services. Mehr ‘n Nisa, a designer boutique, offers an exquisite line of Pakistani and Indian clothing and jewelry. Sophia Chaudhry, owner of Mehr ‘n Nisa and a designer herself, brings out the precision and pride of craftsmanship from the South Asian subcontinent and displays handmade beauty to modern consumers across the globe. A unique combination of rich customs, exquisite culture and handmade bridal outfits will be presented during the show. Manufacturers and exporters for the past 40 years, Queeniee Indian Couture can accommodate custom orders professionally designed by a team of designers in India. A wide collection of bridesmaid and groomsmen attire will be presented at the show. Once just her passion, making brides feel and look beautiful is now her profession. 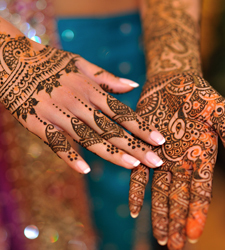 Aarti Amin’s artistic and creative side helps her specialize in bridal henna, hair, and makeup. SOVI Salon combines 5-star service and ambiance to provide excellent hair and skin results. Walk out of the salon feeling refreshed, relaxed and simply beautiful. SOVI also provides bridal makeup, hair, and facial services. Specializing in bridal henna, hair, and makeup, Ruby Beauty Center combines western style with traditional eastern touches. Ruby, owner and beautician herself, achieves customer satisfaction through personal attention, a professional attitude, and creativity.